Hilarious. Nay, pithy. Piquant. Elevating. «In the wake of the July 7 terrorist attacks in London, Scotland Yard brought together law enforcement and intelligence officials from two dozen European countries and the United States, sharing crucial intelligence and pleading for help in tracking down the bombers. But the continentwide kumbaya was shattered when Christophe Chaboud, France's new antiterrorism coordinator, broke the cardinal rule of the club. In an interview with Le Monde that appeared on the newsstands last Monday afternoon - two days after the exceptionally open briefing - Mr. Chaboud announced to the world that he knew "the nature of the explosives" used in the London bombings. It "appears to be military, which is very worrisome," he said, adding: "We're more used to cells making homemade explosives from chemical substances. How did they get them? Either by trafficking, for example, in the Balkans, or they had someone on the inside who enabled them to get them out of a military base." But Mr. Chaboud did not stop with his assessments of the explosives and their origins, which, it turned out, were completely wrong. He plunged into politics, railing at the British with an I-told-you-so air that Europe was a more dangerous place because of the war in Iraq. Some of us call that a fragging, a form of sabotage. The key here is that he "announced to the world that he knew" something that no-one else could have, and from no evidence or confimation of whatever intelligence he had, or rumor that he heard. What a pro. I wish the french citizenry luck because the will certainly need it. Either capitalism, which is the road to hell, or socialism, for those who want to build the kingdom of God here on Earth. Nationalization and private property seizure has just begun. The lefties who dream that we’ll all "go back to the land" want us to bury our good sense there. Jared Diamond, a geographer and biologist recently featured in a National Geographic’s “Guns, Germs, and Steel” presented an explanation from man’s past which applies to the leftish false precepts of nature which paints a silent backdrop of their world view. Diamond was trying to figure out why the social growth of the Papua-New Guineans had plateaued at a level below that of other societies developing in the same way and the same time. He concluded that their poor food producing capacity not only did not let them develop specialized skills like metal tool making, if froze their prospects forever. More time spent and effort expended on the support of survival based on crops with limited nutritional value required them to set aside the developing of other skills that could improve their lot, and such as with the making of metals, the very tools which would give them a way to expend fewer calories to harvest the same caloric value needed to sustain basic nutrition. This lesson is lost, or at least discounted by the new primitivists of the developed world. They sentimentally yearn for simplicity, but forgot that it came with great harshness. They look fondly on a nasty, short, and brutal life to satisfy a yearning for innocence that they have been unable to find in their relations with people or in other disappointments they find with themselves. They probably can’t entertain themselves or find a way to live with the world that they find themselves in, so they get easily bothered by a scare about something like overhead power lines, or wax on their apples. Manual labor is inefficient and creates poverty. In the reasonable west it’s use is normally only reluctantly applied to limited circumstances which can’t be done in any other way. Greenies and primitivists who aren’t very good at math romanticize about people and the land, and men going about their work in a traditional manner which has been long abandoned. They don’t consider human and animal manual labor to be much of an expenditure of energy. Looking to a less mechanized past reveals quickly that people were clearly poorer, and suffered from ailments from that sort of work and shorter, more painful lives from both sever and minor injuries. Prior to the intensive mechanization of construction, it was accepted that the construction of large public and commercial buildings caused one death per floor. Moreover, a manual laborer requires far more in the way of healthcare and food than an operator of machinery does. Food has to be produced, transported, prepared, and so forth. I’m sure that if we didn’t enjoy it so much, greenies would regulate it for the sake of energy efficiency. Fossil and primary fuels however are more embedded more densely with energy. For every unit of mass of it that you have to carry, far more productive output is extracted from it. When a Chavez with a cadre of Chavs “Chavistas” calls for people who have never farmed to abandon the prospects of far more efficient industrial work and go to the undermechanized working of small-holdings or even mass-labor-based collective farms, he is dooming the whole society to mediocrity, in spite of whatever psychological sentimentalism it provides a social-political movement. It is a disservice to that very proletariat which in the end will realize that they were given the opiate of a bad idea to fill their cupboards instead of advancing their needs and quality of life. The least one can do is ignore them. The best one can do is to continue to prove their world view otherwise by living well in a modern world, and occasionally asking them to impirically examine the basis of their reasoning, and why living examples of it only can be found in the least equitable and poorest societies on earth. Remember: in a good society people help the disadvantaged on either the conservative or collectivist model. Either way, they are helped. If a social theory causes that society to help more of them, we aren’t just being stupid, we’re being cruel by bringing more people into mediocrity and misery. The more of them you have to serve, the harder it is on the remainder supporting them, and they too are victimized by a tyranny of bad ideas. Intended to pander to a comfortable sliver of the population that thinks compassion is about helping the greatest number of people, they should be more concerned with the conditions which require so many people to need any help at all. SPD generosity and follow through. Republican generosity and follow through. Will they be spared the inane protests at factories too? Indeed. While France cozies up to the FARC to secure her release, they will get a pass from the vulgar Kultursmog of transnational protestors who would equate the sale of even non-military equipment with opression. No-one will associate their habit of paying ransoms with further takings, and FARC terror will be linked to the U.S. lending moral and limited matrerial support to Columbia to get a handle on those drug peddling "rebels without a cause." "Detention of Cubans in US illegal"
Sure to be a hit film, "The Educators" displays such a typically european sentiment thsy wealth is never earned, is nothing more than something for the lazy, unlucky, and envious to loath and dwell on. With absolutely no perspective on the reduction of poverty in the past two decades, a great many Germans and others in Europe still beleive in that economy is a zero-sum game where the mere existence of the successful always explains why one doesn't have everything one wants. Never mind ones' own efforts - sabotaging oneself doesn't count. Ray and David have more on the German search for "psycho-social justice and comfort". Such humanity, to be found with the finger-wagging, indecisive, middle minded, such universal solidarity…After all, they just want to be loved, don't they? It's all found in the act of making news by choosing what to repeat, and re-repeat, and re-re-repeat. «Dear terrorists, new firman issued. Kill 10, take a branded T-shirt and be best terrorist in the group. Get a piece of the beard. 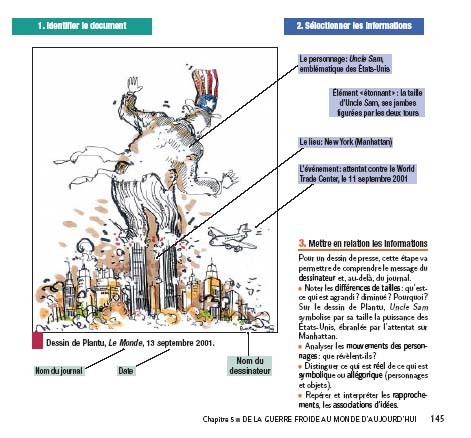 Their role is to say: "We are all (fill in the blank)"
According to some mec, one Edwy Plenel writing in Al-Jezeera on the Seine, supplicant dimmitude is brave, Americans seeking to do away with the chances of future 9-11 attacks are “deer trapped in the headlights” who would enact a barbarous Patriot Act. Apparently, American’s flaw is that they aren’t mentally wagging the slinky enough and aren’t p-whipped enough by terrorists to please this self-absorbed twit’s sensibilities. « Il dit enfin, avec ces trois personnages qui, loin d'être oisifs, paraissent s'être arrêtés dans cette bibliothèque sur le chemin ou au retour de leur travail, que cette activité d'apparence passive ne contredit pas l'action ni ne nuit à la détermination. Pour bien agir, de façon pertinente, efficace et durable, mieux vaut prendre le temps de la réflexion. «In the end it says, that far from being idle, that this activity of passive appearance does not contradict the action nor does not harm the determination. To act in a relevant way, effective and durable, it is better is to reflect. Being flummoxed by the possibility that someone out there has a murderous view of the world and is willing to kill civilians at work, in train stations, and so forth is “action”? Whatever you say, Sparky. The blitz was not a “collective resistance” – it was an attack on civilians, and not the military, and the resistance was in people’s hearts, not their actions while they were being bombed. For this sort, emotions are interchangeable with human action. This is an irrational trap that the grossly self-absorbed and unrealistic fall into, at least when the RISKS are only to their emotions, and those risks aren’t real to them, because it’s OTHER PEOPLE who are being killed. Purportedly, these are people Mr. Sparky Feely “cares about”. He wants the rest of us to be martyrs to his only cause – propping up his view of the world which impirically has never been tried successfully, not at least without killing one’s fellow citizens through negligence and inaction. Merci et remerci, Priticus (Maximus) for the tip. tried to draw a distinction between a more expansive and a more restrictive neoconservative foreign policy. I [call] the two types, respectively, democratic globalism and democratic realism. The chief spokesman for democratic globalism is the president himself, and his second inaugural address is its ur-text. What is most breathtaking about it is not what most people found shocking--his announced goal of abolishing tyranny throughout the world. Granted, that is rather cosmic-sounding, but it is only an expression of direction and hope for, well, the end of time. What is most expansive is the pledge that America will stand with dissidents throughout the world, wherever they are. This sort of talk immediately opens itself up to the accusation of disingenuousness and hypocrisy. After all, the United States retains cozy relations with autocracies of various stripes, most notably Egypt, Saudi Arabia, Pakistan and Russia. Besides, if we place ourselves on the side of all dissidents everywhere, must we not declare our solidarity not only with democrats but with Islamist dissidents sitting in Pakistani, Egyptian, Saudi and Russian jails? But we do not act this way, and we need not. The question of alliances with dictators, of deals with the devil, can be approached openly, forthrightly and without any need for defensiveness. The principle is that we cannot democratize the world overnight and, therefore, if we are sincere about the democratic project, we must proceed sequentially. Nor, out of a false equivalence, need we abandon democratic reformers in these autocracies. On the contrary, we have a duty to support them, even as we have a perfect moral right to distinguish between democrats on the one hand and totalitarians or jihadists on the other. In the absence of omnipotence, one must deal with the lesser of two evils. That means postponing radically destabilizing actions in places where the support of the current nondemocratic regime is needed against a larger existential threat to the free world. There is no need to apologize for that. In World War II we allied ourselves with Stalin against Hitler. (As Churchill said shortly after the German invasion of the U.S.S.R.: "If Hitler invaded hell I would make at least a favorable reference to the devil in the House of Commons.") This was a necessary alliance, and a temporary one: When we were done with Hitler, we turned our attention to Stalin and his successors. During the subsequent war, the Cold War, we again made alliances with the devil, in the form of a variety of right-wing dictators, in order to fight the greater evil. Here, again, the partnership was necessary and temporary. Our deals with right-wing dictatorships were contingent upon their usefulness and upon the status of the ongoing struggle. Once again we were true to our word. Whenever we could, and particularly as we approached victory in the larger war, we dispensed with those alliances. «Her husband, Joseph Wilson, went off to Niger, did no investigation and came back and lied about what he had allegedly discovered. The bi-partisan 9/11 commission concluded that Wilson’s claims were false – a year and half after the damage the Plame-Wilson team intended was already done. Immediately the Democratic Party leadership jumped on the President calling him a liar and a fraud using the 16 words in the January 2003 State of the Union address about Niger as evidence. It emboldened our terrorist enemies, and sowed distrust in Europe and throughout the world about American policies, continued for more than six months with of course the megaphone provided by the NY Times and other Bush-hating and America bashing media institutions. «But the Left's entire rationale for the "Fire Rove" tidal wave is that revealing Valerie Plame's status as a CIA employee was nothing more than a "shameful," "despicable," and "disturbing" act of "retaliation," "retribution," or "revenge." If they admitted that Wilson layered lies upon lies, then logic dictates that Rove did no more than encourage a reporter not to be hoodwinked. Even if you give Wilson the benefit of the doubt on that count, though, the career diplomat still has not been on speaking terms with the truth. Yeah right! Keep working it, Mr. and Mrs. Poser. … The act encourages women to make false allegations, and then petition for full child custody and a denial of all fathers' rights to see their own children. If nothing else, boys and girls, send your representatives a copy of the Phyllis Schlafly article. Within 90 minutes of President Bush's nominating Harvard law graduate DC Circuit Court Judge John G. Roberts, typically unctuous surrealists like Billmon start the harping. I love the last paragraph, where the Carl Rove is thrown in as an enitirely unlrelated issue for good measure. Even the cultural dinosaurs of NOW leapt to call Roberts a "radical extremist" as if NOW isn't extremist itself, and as if they would have ever howled otherwise. I do not want to fall into the Administration's trap of getting so distracted by this judicial nomination that I don't pay attention to other injustices of the Administration, like the war in Iraq, the detainees, military tribunals, the potential abolition of habeas corpus in death cases, and Rove Gate, to name a few. The Senate hearings will quite naturally turn into a circus with predictions of armageddon, because, well, that's just the way leftist are - the joy of rage is all that matters to them. It's the way they have been for decades. Meanwhile, the rest of civilization grew and evolved. If you don't believe me, take a quick survey of these bloggers' "mood meter" at the top of each post. How charming... Zionist Americans… If they were Zionists they wouldn’t be living in the US, and I don’t think they would be hostile to Britain. The fair-weather interfaith types will surely eat Al-Siba’i’s nonsense up, call it a case of hurt feelings, and look to the rest of us to show him sympathy. It’s about their feelings. Not Al-Siba’i’s, not the public’s, and certainly not those of the victims and their loved ones. writes Gateway Pundit and Chrenkoff (thanks to Instapundit). Many years ago, when "peace" protestors demonstrated against Ronald Reagan for "peace", my dad used to point out that the Copenhagen museum devoted to the resistance against the Nazi occupation (during which his uncle was killed) was called Frihedsmuseet (the freedom museum) and not Fredsmuseet (the peace museum). To that, I will add that (the letters in the Danish word for) Fred ("peace") can be found in Frihed ("freedom"), but not the other way around. I daresay: Sorry to bother you, but if you don't mind, would you be so kind as to tell us the name of the person who would happen to be the current occupant of the Executive Mansion? Of course — snicker! — there are/were no links between Osama bin Laden and Baghdad — eye roll — and the war to depose Saddam Hussein has done nothing but — snort! — divert attention from the necessary war on al Qaeda. In fact, ABC said as much back in… 1999! writes Walter E Williams (emphasis added). This myth holds that poor countries are poor because income is so low that savings cannot be generated to provide the kind of capital accumulation necessary for economic growth. Thus, it is alleged, the only way out of perpetual poverty is foreign aid. Some economic development "experts" attribute Africa's troubles to its history of colonialism. That's nonsense, because some of the world's richest countries are former colonies, such as the U.S., Canada, Hong Kong and Australia. In fact, many of Africa's sub-Saharan countries are poorer now than when they were colonies, and their people suffer greater human rights degradations, such as the mass genocide the continent has witnessed. One unappreciated tragedy that attests to the wasted talents of its peoples is that Africans tend to do well all around the world except in Africa. This is seen by the large number of prosperous, professional and skilled African families throughout Europe and the United States. Back home, these same people would be hamstrung by their corrupt governments. The worst thing that can be done is to give more foreign aid to African nations. Foreign aid goes from government to government. Foreign aid allows Africa's corrupt regimes to buy military equipment, pay off cronies and continue to oppress their people. It also provides resources for its leaders to set up "retirement" accounts in Swiss banks. What Africa needs, foreign aid cannot deliver, and that's elimination of dictators and socialist regimes, establishment of political and economic freedom, rule of law and respect for individual rights. Until that happens, despite billions of dollars of foreign aid, Africa will remain a basket case. "Forgiveness" of foreign debts is always high on the agenda of those on the political left. At any given moment, this would of course free up money that African governments could spend to help relieve their people's distress -- assuming that this is what they would spend it for. But why would anyone think that promoting irresponsible government borrowing by periodically "forgiving" their debts is going to help African countries in the long run? …Promoting dependency and irresponsible borrowing is not the way to help the poor internationally any more than these are ways of helping the poor at home. Such policies benefit the bureaucracies that administer foreign aid and enable vain people to see themselves as saviors, even when they are doing more harm than good. Sub-Saharan Africa has some of the most tragic geographic handicaps of any region of the world. Navigable waterways, which have been crucial to the development of nations and of cultures, are severely limited in most of Africa. Poor soil and inadequate and undependable rainfall patterns shrink the possibilities still further. Ideologues love to think of African poverty as caused by "exploitation" on the part of Western countries. But, with a few notable exceptions, Africa has had little to be exploited. Even at the height of European imperialism, there was far less foreign trade or foreign investment in the whole vast continent of Africa than in a little country like Belgium or Switzerland. In more recent times, so-called "foreign aid" has left many monuments of futility in Africa, from rusting machinery and the ruins of many projects to cows sent from Europe that keeled over in the African heat. With all its handicaps, Africa used to feed itself and even export agricultural produce to Europe. In some of the more geographically favored parts of sub-Saharan Africa, iron was smelted thousands of years ago. During the first two decades after African nations gained their independence in the 1960s, one sub-Saharan nation that stood out with its economic prosperity and political stability amid economic disasters and social catastrophes among its neighbors was the Ivory Coast under President Felix Houphouet-Boigny. Yet neither the Ivory Coast nor its leader attracted nearly as much attention, much less adulation, as was showered on Julius Nyerere in Tanzania, Kwame Nkrumah in Ghana, or other big-name African leaders who led their countries into ruin. The Ivory Coast in those days relied on markets instead of the kind of policies and rhetoric that the intelligentsia favored. When its policies changed, it became just another African basket case. Today, too many people in the West continue to see Africa as an outlet for the visions and policies of the left that have failed in the West and are even more certain to fail in Africa. many African societies have been isolated by that continent's dearth of both navigable rivers and harbors. Small, tribal societies were another consequence of geographic isolation -- and the vulnerability of such societies to conquest by outsiders was another. Poverty-stricken Africa could afford these economic and social disasters far less than the affluent West could. surely, even the most drugged-up of the rock singers knows that most of the money that has been heaved at the continent since the chaotic end of colonialism has been either wasted or filched. Britain's Royal African Society claims that in the past 50 years, Africa has received a trillion dollars in aid, 10 times the aid sent to Europe after World War II. However, more Africans live in deeper poverty today than when the aid began to flow. Recently, it was revealed that corrupt Nigerian officials pocketed 220 billion pounds in bribes over the past few years. How much the other corrupt officials throughout the continent have accounted for can only be imagined. Nonetheless, the assembled rockers shouted -- some called it singing -- threats to the political leaders of the West to take action to end the evils afflicting Africa. None has been supportive of Tony Blair's and George Bush's attempts to end the evils recently afflicting Iraq. Yet, military action against Africa's corrupt potentates is about the only imaginable way Africa's suffering can be alleviated in the near future. Would they like us to commence "regime change" now, or after we have brought democracy to Iraq? …overlooked by well meaning rockers is that as long as tyrannical governments control the distribution of funds those targeted for relief never get it. Starvation is indeed a problem in many parts of Africa, most especially in the Sudan. But in this nation emergency food relief sent by the U.S. and others is used as a weapon to subjugate designated enemies of the government. This has been a pattern observed earlier in Somalia, Ethiopia and Eritrea. Despite the claim of Jeffrey Sachs of the Earth Institute that America foreign aid to Africa is niggardly, the problem that neither he nor his colleagues consider sufficiently is how best to ensure that these foreign aid dollars end up in projects for which the money is earmarked rather than Swiss bank accounts for corrupt leaders. As Peter Baur, the father of development economics once noted, "foreign aid is little more than poor people in rich countries giving money to rich people in poor countries." While [the stars] were rappin' and rockin', James Shikwati, a distinguished Kenyan economist, was singing another song: "For God's sake, please just stop the aid." In an interview in der Spiegel, the German magazine, Mr. Shikwati describes what he sees as the disastrous result of aid to Africa. Not only do African leaders exploit it for their own purposes, stuffing their pocketbooks and adding to their power, but aid weakens local markets, destroys incentives and fosters corruption and complacency. He scoffs at the motives of the United Nations World Food Program, "which is a massive agency of apparatchiks who are in the absurd situation of . . . being dedicated to the fight against hunger while . . . being faced with unemployment were hunger actually eliminated." …Increasing numbers of Africans decry the damages of paternalism, but you didn't hear those voices at the Live 8 concerts. Rage and protest were not directed at corrupt local leaders, either. A study just published by the International Policy Network in London reports that, despite $400 billion in aid expenditures in Africa from 1970 to 2000, the correlation between the aid and economic growth was negative. Increases in aid resulted in worse economic performance. The general explanations for this negative correlation between aid and economic performance are that aid discourages the very activities that produce economic growth and vitality — savings, investment, and incentives for government policies that encourage and sustain positive economic activity. If we change the question we ask regarding poverty, the picture of the problem becomes clearer. We should examine the conditions that allow prosperity to occur rather than asking how to spend money to eliminate poverty. As President Bush prepares to discuss global poverty in general, and in Africa in particular, with other world leaders, he is under great political pressure to agree to address poverty with aid money rather than pressure for policy reforms. As I noted earlier, the aid issue lends itself readily to politicization. The Europeans are forever looking for angles to blame America for the world's ills. Recently, pastors from some of the largest black churches in the United States wrote to the president urging large increases in US aid to Africa. As we celebrate the 229th birthday of the United States, we should remember two things. First, we are the most generous nation in the world. Americans delivered $80 billion to the developing world in aid and assistance last year. Of this $80 billion, over $60 billion came from private rather than government sources. Second, Americans have the capability to provide this largesse because we are free and freedom is what produces prosperity everywhere. a cure for poverty has already been found. Yes, a cure! And by freedom I mean more than just the right to buy rock 'n' roll records. I mean the right to private property, to buy and sell, to compete for any peaceful business. And more. Free markets and free individuals — communicating, trading, praying, working, with maximum liberty and minimum harassment from criminals or governments. …Dictators destroy economies. And too often they take the aid we send to help the poor and use it to stay longer in power. Africans know this well. Asked about more aid, a Kenyan health care worker quickly and depressingly predicted that "the aid money will go into the pockets of corrupt officials to buy their fully loaded Mercedes-Benzes." "For God's sake, please stop the aid," Kenyan economist James Shikwati bluntly told a German weekly. "If the West were to cancel these payments, normal Africans wouldn't even notice. Only the functionaries would be hard hit." … Ousmane Sembene, a Senegalese-born filmmaker, called the efforts "fake." Nigerian musician Femi Kuti called Live 8 a "waste of time." These men and others are looking elsewhere for solutions. Kuti cites a need for new leadership, saying, "Africa has very many old leaders who do not want to leave office. They are the ones who have made our debts reach billions of dollars through corruption and stealing. And they are still asking for more so that they can steal to their graves and leave the youth with the burden of paying the debts." Mr. Shikwati says Africa "must take the first steps into modernity on its own. There must be a change in mentality. We have to stop perceiving ourselves as beggars." Sembene states what is obvious and overlooked, "The only way for us to come out of poverty is to work hard." True, the Live 8 campaigners are on target in demanding that Western governments end the agricultural subsidies that hurt African farm products in the world market. This is precisely where Americans can make a difference for Africans — by demanding a free market system here at home. But the rest of the Live 8 agenda rehashes the same old snake oil: the West, with wealth produced by the freedom we have, must bail out countries in Africa, where government corruption and tyranny make progress impossible. Luckily, Africa's future does not depend on Western aid. Or even rock 'n' roll. Africa simply needs freedom. It won't be easy to come by. Never is. But it is a crusade that can and must be won by Africans themselves. Time for a new campaign to make poverty history? Call it "Liber-8." Whom from Cuba to Invite to Celebrate France's Bastille Day? Shamefully, they expressly didn't invite any of Cuba's political dissidents: France's government had promised to turn a cold shoulder to democracy activists struggling to free themselves from their own (island) prison. By leaking sensitive intelligence information on the London bombing, writes Elaine Sciolino (merci à Jon Baum et Gregory Schreiber), France's new antiterrorism coordinator broke the cardinal rule of the club and "the bonds of trust". [Christophe Chaboud] did not stop with his assessments of the explosives and their origins, which, it turned out, were completely wrong [!]. He plunged into politics, railing at the British with an I-told-you-so air that Europe was a more dangerous place because of the war in Iraq. "The war in Iraq has revived the logic of total conflict against the west," he declared [to France's newspaper of reference], without adding the obvious, that Britain supported the war and France did not. Neither did he mention the mention the obvious that a framework is being set up for the French élite (it always is, that's a permanent fact of life here) where anything that goes wrong in France in the future (terrorist attacks in this specific case) can be blamed, directly or not, on America, the Anglo-Saxons, and/or the capitalists (or their leaders, if you want to be cute). So poisonous is the atmosphere that the talk in European intelligence circles is that the British feel that the French may have leaked bad information on purpose. "My friends in London are furious at the French about this," said the director of a European intelligence agency. "They believe they released this incorrect information deliberately." The result, he added, is "there's not much good will left between them." What this does is help confirm what I have been observing over the past few years: it puts the lie, at least partially, to the myth — oft repeated by (usually well-meaning) Frenchmen to their Anglo-Saxon counterparts (officals or common citizens) — that too much importance shouldn't be granted to French anti-Americanism (or "anti-Anglo-Saxonism") because under the surface, French citizens are reasonable, and lucid, and unfazed by the ruckus and impervious to the drone. I wish it were so, les gars, but I trust this (self-serving) mantra less and less, and I am less and less willing to believe that it has ever been otherwise to a great degree. writes Armstrong Williams (as he indirectly answers Christophe Chaboud). Meanwhile, the problem gets worse, not better. Much of the Muslim world is impoverished. They lack many basic rights we associate with happiness. This won’t change if we pull out of Iraq. It won’t change if we alter our policy regarding Palestine. As long as Islamic tyrants continue to control the flow of information in the Muslim world, they will continue to condition the children to believe that the Western world is responsible for the ruin of their lives. The only way this will change, is if we facilitate democracy throughout the region. The only way to marginalize the Jihadist ideas is to make sure the people have access to alternative viewpoints. We cannot defend against every terror attack. But if we break the stranglehold of ideas in the Muslim world, then maybe children will stop strapping bombs to their bodies and detonating themselves in our subways and on our streets. «But for the Sueddeutsche Zeitung [leftist holding hands...], the debate generated by the study, based on an assessment tool known as Pisa, has become a "national fetish". "Forget PISA!" the paper urges. To the european media's old guard, helplessness, disappointed surprise, and passive agression knows no bounds. They're even fooling around with something Americans have been using for 50 years in dryer parts of the country - evaporative cooling or "jungle coolers". There's one problem - they just don't have much of an effect in environments as humid as France's. In fact from that perspective it's an awful choice of technology. So ineffectual that it's a WASTE of energy to achieve a mere, stinkin' 2 degrees celcius. Amazingly, they continue to live with the planned meagerness Americans persuaded themselves out of 30 years ago. It comes from artificially propped up energy prices which reduces the quality of life for the entire population, but especially on people with the least. It manages to conserve VERY little since consumption of energy is less, but isn't significantly less than North America especially as it relates to cost. In fact all it does is make it cost a great deal for no clear reason. Congratulations. They've done a fabulous job of proving themselves to be the idiots of the engineering world. If they keep this up, they'll be living in mud huts - sorry... "pisé". «Like millions of other Jews, my great-grandmother was born into a life of terrible poverty and even worse discrimination in a small town in the Pale of Settlement. She never attended school and could not read or write. Her earliest memories were of death, pogroms, hunger and cold. Escaping to England with just a few roubles in her pocket, she spent the next few years helping raise her younger brother and sisters and working 12-14 hour days in various sweatshops. On Saturdays, she got up at 4 in the morning to "stand markets" so she could earn a little extra to help feed and clothe her family. Not a few times, she was called a "dirty Jew" and told to "go back to Palestine." On at least two occasions, children threw stones at her. Starting a business with her recently demobbed husband who had spent four years fighting in the trenches, she made her way up the ladder inch by painful inch. During World War II, she personally helped save many Jews from the gas chambers. The Jewish inhabitants of her own town were all murdered. She died possessed of a considerable fortune at age 86 in her very beautiful home in Hampstead. All of her children and grandchildren were or would become university graduates. All of her children and grandchildren attended private schools. Having been gassed in the trenches, her husband never really regained his health, and died in his late 30s leaving her to cope alone with a growing family and burgeoning business. And to think that people are trying to gin up and pin "root causes" on jews - the very people who know more about human loss than anyone wagging their fingers at them and demonising them... Those "talking heads" are sick, sick people, and should be ashamed of themselves. The World's jews know more about forgiveness and moving on that their critics ever will. "It is not the plane that killed the thousands of people [on 9/11], but rather Uncle Sam." "The World Trade Center was not destroyed by the planes, but because the Americans built it too high." …the usual response of governments is mere condemnation of an atrocity, describing an outrage as "unacceptable"
writes James Molyneaux, who witnessed the dead of Belsen (danke zu Franz Hoffmann, who also points to Dissent's Paul Berman article, und zu Jon Baum). Next come a string of concessions to the offender, leading to a craven suggestion that the victims must share some of the blame, and then concessions to the demands of the perpetrators. Opinion formers appear to have forgotten Kipling, who warned of the outcome. Increasingly, the general public weakens in its resolve. Under the label of moderation, it is fashionable to plead for understanding; to do a Chamberlain and settle for a piece of crumpled paper in the mistaken belief that the word of dictators and terrorists can be trusted. Today, we should reflect on our responsibilities, and those of our governments, to stand up to the prejudice and tyranny that can still, today, lead to genocide. These events happened in my lifetime. They are not lost in the past; they could still happen again today. End of series. You may puke now.